Oskar van Deventer has been at it again, and this is the latest (well latest published as far as I know) design from the incredible puzzle generating mind of the Dutchman. This time it's an intersection of six pentagonal sticks to form a pyramidal shape. The goal is to take the sticks apart, and put them back together again. 3D printed by Shapeways, the pieces are dyed into six bright colours (plus black and white) and have a solid feel to them. the trapped powder inside each stick really adds weight and a feeling of quality that can sometimes be lacking in Shapeways printed materials. 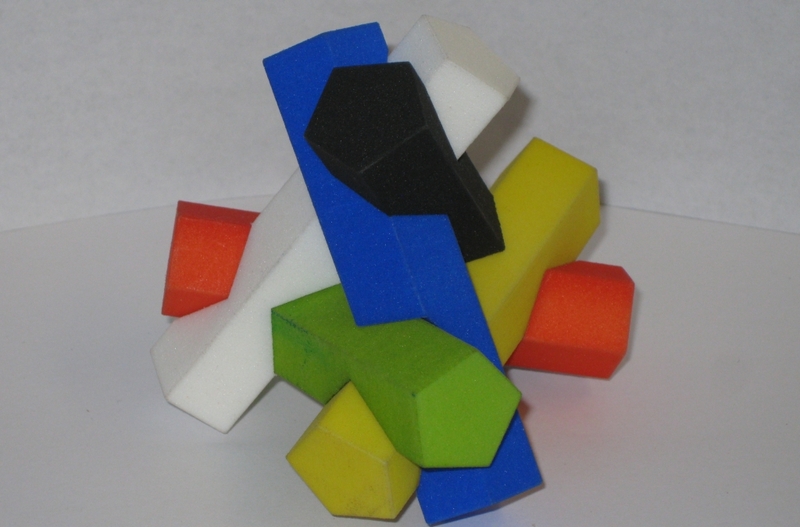 The puzzle measures approximately 3.5" tall once assembled, with each stick being 3.5" long with a 7/8" cross-section. The sticks just keep on holding. The fit is perfect, and each of the sticks holds the others at the right angles all the way until the last two pieces. That certainly makes this a much more enjoyable puzzle to play with, as you don't feel like you're fighting your own fingers and wrestling with a dexterity challenge. There's one key piece, followed by five notched sticks which must be removed in sequence to take the puzzle apart. While it's not trivial after the pieces are mixed up, I'd say that this is certainly an approachable puzzle for most people. Having taken it apart, and mixed the pieces, then left them alone for a while, I was able to put it back together in around 20 minutes. Now, I'm no expert in this style of assembly puzzle, but it was both fun and a good level of challenge for me. 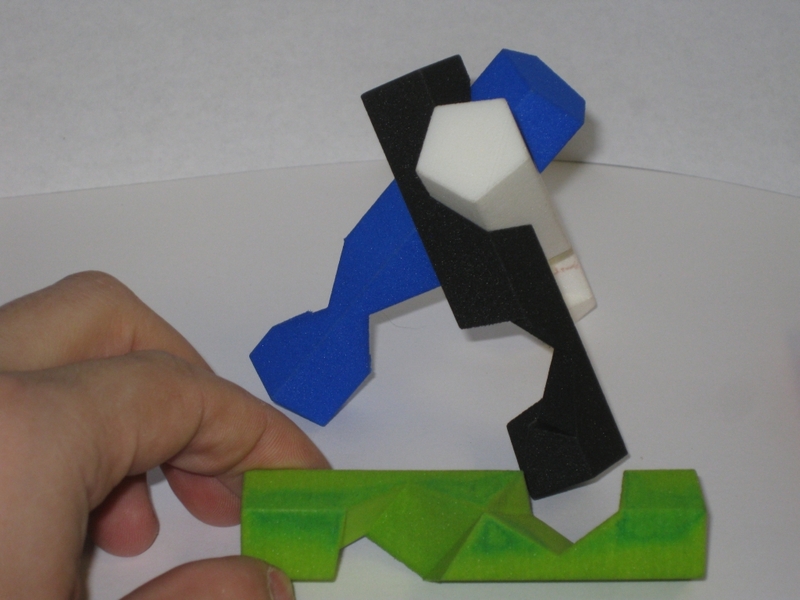 Penta Beams is available from Oskar's Shapeways shop if you'd like a copy of your own.